We have collected and analysed 15 expert reviews and 117 user reviews from international sources. Experts rate this product 80/100 and users rate it 86/100. The average review date is 22-01-2018. We have compared these reviews to 213025 reviews from other Smart Watches & Activity Trackers. The alaScore™ for this product is 95/100 = Excellent. Last update: 24-04-2019. Garmin Vivosport review: A GPS-equipped fitness tracker that packs in plenty of extra features that make it a versatile fitness companion. This slim "smart" activity tracker features GPS, a heart-rate monitor, color touch-screen and 15 built-in apps. The Vivosport packs smartwatch features into an activity-band design that's lightweight, comfortable to wear, and has good battery life. 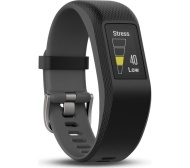 It's fully waterproof and has built-in GPS and 24-7 heart-rate monitoring. Some of the features are a little difficult to access. GPS can take too long to lock in. Comfortable. Easy to operate. Great automated activity-tracking options. Customizable. Supports push notifications. A little expensive for a sports band. No swim tracking. The Garmin Vivosport is a GPS-enabled activity tracker with features you typically find on higher-priced sports watches.